The first US waffle iron was patented in 1869. Since then various companies have manufactured waffle irons. 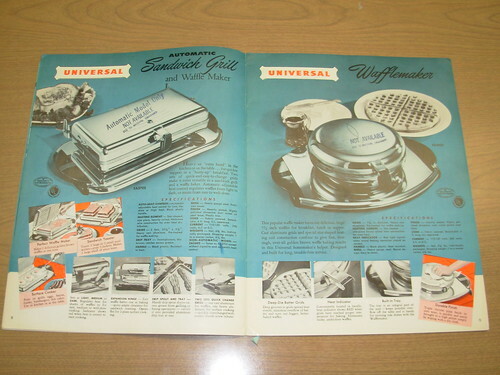 In the Universal Electric Housewares catalog from 1950, Landers, Frary & Clark advertised the Universal Sandwich Grill and Waffle Maker as an appliance which makes “quickie suppers or a ‘hurry up’ breakfast.” Besides making waffles and toasting sandwiches, it also fries or grills eggs, bacon, hamburgers, and fish cakes. It comes with two “quick-and-easy-to-change grids” which transform it from a waffle maker to a surface grill or vice versa. And the expansion hinge allows both small and large sandwiches, even “3-deckers,” to be toasted. Universal Electric Housewares and other catalogs from Landers, Frary & Clark of New Britain, Connecticut can be found in the Trade Literature Collection at the National Museum of American History Library. Previous Post Happy Birthday, August Weismann! Makes me hungry for waffles! An impressive share! I’ve just forwarded this onto a co-worker who has been doing a little research on this. And he actually bought me breakfast simply because I found it for him… lol. So allow me to reword this…. Thank YOU for the meal!! But yeah, thanks for spending the time to talk about this issue here on your web site. I have the waffle maker that’s in your 1950 catalog and it still works. Does the Smithsonian want it?